Eric Nuzum is a PoPville contributor and Petworth resident. You can catch Eric on Wednesday, August 15th for the launch party, reading, and Q&A at Wonderland Ballroom, 1101 Kenyon St NW. You can read the first excerpt here. 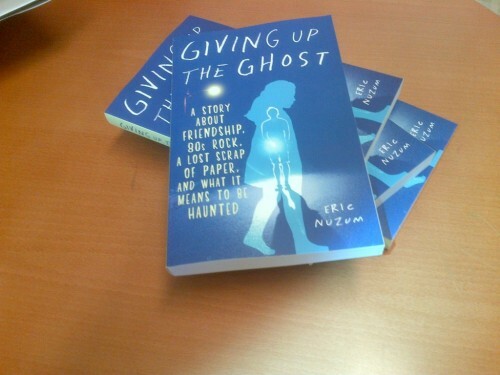 Giving Up The Ghost likes to pretend it is a book about ghosts (and there are tons of ghosts in it), but it’s actually about friendships. One in particular. A young woman who went from acquaintance to best friend to crush to source of endless frustration to…eventually, becoming a ghost herself. “Hey,” announced a girl’s voice. “Oh . . . I’m just . . . umm,” I answered. “Sure I do,” I lied. “Laura,” I replied, as if saying the word out loud would pluck the connection out of the haze for me. “Sure I did,” I said, telling the truth this time. I knew she had been on some exchange program to some foreign country and had been gone the whole school year. I had met Laura in junior high, where she was a year behind me. At the time, she was “going with” my friend Timmy. Outside of note passing and the occasional tight-lipped kiss after school events, “going together” in seventh grade was pretty meaningless. You couldn’t drive, had nowhere to go, and either weren’t allowed or couldn’t afford to do anything. It was kinda like being an old married couple, except you could control your bowels and stay awake past 8 p.m. Even with these limited expectations, Timmy wasn’t really up to the task. He even had me break up with Laura on his behalf. We ended up at the same high school and exchanged occasional hallway greetings, which sometimes had a tendency to linger for a bit. We’d catch each other’s glance at pep rallies or assemblies. Laura and I had study hall at the same time. By this time Laura had grown into the perfect little fresh-faced A student. She wore cute sweaters, Docksiders, and peg-legged jeans. After we started talking at study hall, I was surprised at how witty she was. Previously, she’d come across as quiet, almost painfully shy. But the more time I spent around her, the more brightness emerged. She was funnier than me (not a high mark, but I was still impressed), she was way smarter (again, not a tough standard), she knew more about music and books than I did (which really got to me), and she had a comeback for every smart remark I volleyed in her direction. Eventually we were sitting together every day and talking about everything: politics, religion, the twisted imbecile logic of people, whatever. I never seriously thought of her as anyone I would date or see outside of school; she was just someone fun to pass time with. The summer after her sophomore year she left to spend her junior year abroad, and since I knew I’d graduate before she got back, I figured that was the end of it. There are times when injecting even the smallest amount of separation into a friendship makes reconnecting uncomfortable. I fumbled with the phone a bit to buy a second or two to think of something to say. “Eleven, huh?” I said, trying not to sound impressed. Outside of a trip to the Canadian side of Niagara Falls, I’d never been outside the United States. I hadn’t even visited my fifth state yet. While I was drinking, masturbating, and being haunted by the Little Girl, Laura was widening her lead on cool music. I needed to instantly juice my cred. This, technically, was not a lie. Jimmy and I had put an ad in the local record store looking for bandmates. Despite a list of “influences” that clearly set out that we were destined for punk-rock greatness, the only calls we’d gotten were from heavy-metal wannabes. What we wanted were punk-rock wannabes, but we were patient. “Now that school is over?” I asked. After a few more minutes of back and forth, we decided to get together the next afternoon. I was given some very clear instructions about picking her up. I was to drive to her parents’ house and wait. I was not to get out of the car, approach the house, or knock on the door—just show up when I was supposed to and sit there. I got there a little early. Laura’s house was small—really small—maybe three or four rooms. Even if the attic had been finished, I couldn’t quite get my head around how two parents, Laura, and her two brothers could fit into that space. Her house sat in a neighborhood that looked like it had been built all at once during the 1950s. The homes had rarely been updated since. There wasn’t a lot of landscaping or trees. In our study-hall conversations before she went to Finland, it was obvious that Laura cared about her family, but she equally went out of her way to avoid talking about them. She only shared what she wanted to share, which was little. I put the seat back and shoved a tape into the deck: The Smiths, Meat Is Murder. It seemed like a good choice to demonstrate my coolness. I found three warm beers in the backseat and started on one. I’d begun to doze off when I heard the door open quickly and slam shut. I looked over and was shocked out of my light buzz by this smiling thing in my passenger seat. Her hair was jet black, lying dead flat in some areas, wildly askew in others. It was cut to different lengths, looking like she had trimmed it herself without a mirror (which, I’d soon learn, was the truth). It hung over her face, completely covering one of her eyes, which were underscored with thick black eyeliner. She wore a white, ratty T-shirt that had things written on it in Magic Marker that I couldn’t read, despite a preponderance of exclamation marks next to the words. Her black jeans looked like they’d been put through a tree mulcher, then taped and pinned back together. But she still wore the Docksiders I remembered her for. She looked as if someone had brined her in a vat of punk rock, then forgotten to rinse her off afterward. It was a metamorphosis. I didn’t want her to know how mesmerized I was. “Looks like you had an interesting year” was the only thing I could think of to say. “Fine. Where are we going?” I asked. “Why don’t we go someplace you want to go?” she offered. We rolled down the windows and started off. We just drove. Once we pulled away from the curb, I can’t remember a single word we said to each other for the rest of the day. I don’t even remember enough to reconstruct what might have been said. Even if I could remember, how do you describe a moment like that? A moment that simply stuns you. A moment when everything seems to suddenly freeze and explode. Perhaps you just discovered the best friend you’ll ever have, or perhaps you just fell in love, or perhaps everything you thought you knew suddenly changed. We left her house as minor-league acquaintances and returned several hours later as best friends. Even though I remember a lot of other times with her, that day has been put somewhere where I’m not allowed to access it. It’s like my memory wanted me to simply keep a few images of that day and that’s all. I remember that it was sunny and warm and the sky was blue. I remember her hair flapping in the wind. I remember noticing, for the first time, that she had very small teeth. I remember that the roar through all the windows meant we had to yell our entire conversation. I remember that I kept making jokes and she laughed a lot. I remember that she’d always try to push her hair behind her ears whenever she was about to make a point. I remember fumbling a lot with the tape player. I remember that she punched my arm at least three times for making smartass comments. I remember that I didn’t think once about getting high or about the Little Girl in a Blue Dress. I remember that when I dropped her off at home, we exchanged tapes. She gave me a dub of Killing Joke’s Fire Dances, and I gave her my copy of Brian Eno’s Music for Airports. I remember knowing, even then, that I’d remember that day for the rest of my life.